Elisabeth Thorsen (1966) graduated from the Faculty of theology, University of Oslo in 1992. She has been involved in teaching, interreligious dialouge, writing and social work alongside while working as a pastor in the Church of Norway. 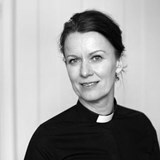 She began work at Oslo Cathedral in 2003 and is now the Reverend Canon there. Her outlines for the cathedral’s vision of OPENNESS, has been crucial for cathedral programme and profile. She applies an existential hermeneutic in preaching and interaction, for a faith steeped in Christian traditions, as well as for daily life. She played a central role in the cathedral’s response to the events of 22. July, 2011. – (2014): “Totem og tabu – Bidrag til teologien” in Freud, Agora: Journal for metafysisk spekulasjon, 1-2 (2014) 166-181, Oslo : Aschehoug. – (2010): “Salige er de fattige. Himmelriket er deres” in Rettferdighet (Beatrice Halsaa (red. ), Anne Hellum (red.)) 240-253, Oslo: Universitetsforlaget.